Choose different types of questions for your form. Sometimes questions can be asked in more ways, with QPoint you have limitless power to ask questions efficiently. Multi choice is a type of question that provides respondent with a set of answers to select. It can be single select or multi select type. 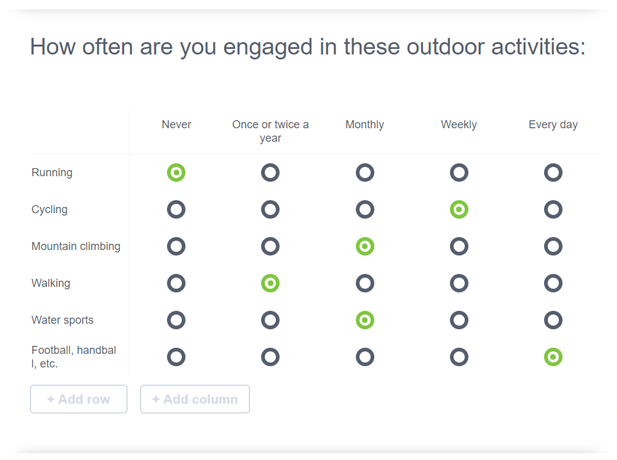 With single type (radio buttons) respondents can choose only one answer, where with multi select (checkbox) type respondents can select multiple answers. To set your question from single to multi select type, open question settings and turn on multi select. 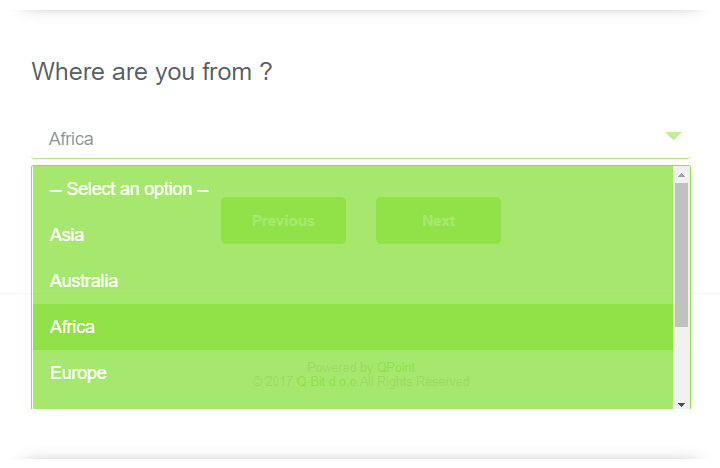 Dropdown select this type of question is usually used when there are a lot of answers that questioner do not want to display all at once. This is commonly known as ‘dropdown’ and it is a single select type where respondents can select only one answer. Image select is type of question where you ask a textual question, and offer images as answers, and the respondent chooses, instead of the textual response, the image. 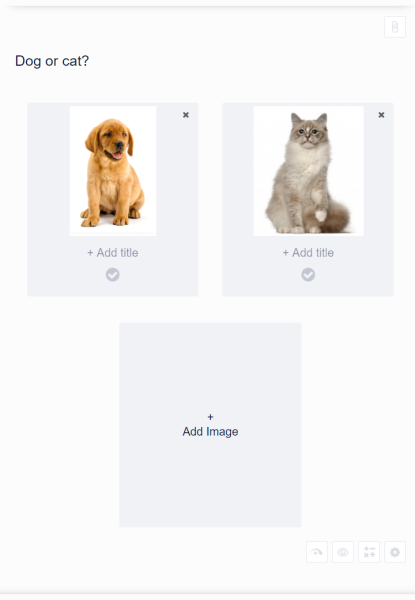 You can easily add pictures just by choosing “add image” in answers of this question type. You can also choose different image size, small, medium and large, which best suits you. 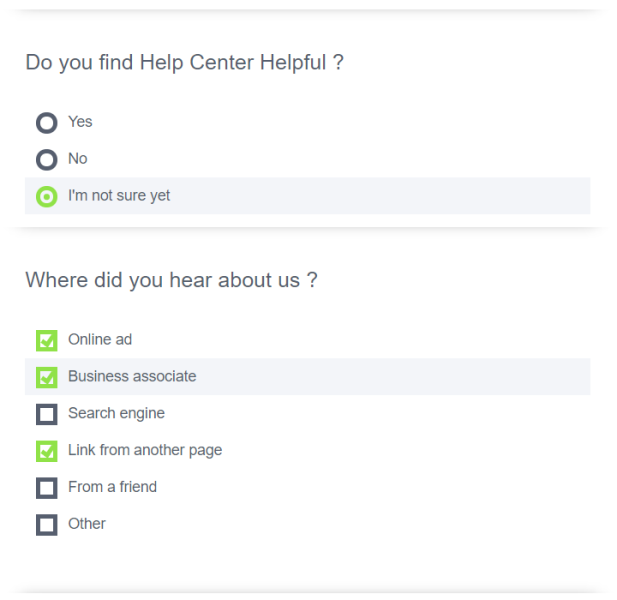 Matrix question allows you to set a few items in one question that respondents need to evaluate. Using the Matrix question, you set the items you want respondents to evaluate horizontally, and the response option vertically. This can be, for example, a scale from "Very satisfied" to "Very dissatisfied" and so on, it is up to you to decide what you will evaluate and to what scale. Single textline commonly used to collect respondents information like first name or last name. It is open-answer question type where respondents can write anything, for example name. Sometimes is used as part of multi-choice question as ‘other’. Multiline text is type of question where you collect respondents statements, messages, comments and more. Statement is used when questioner wants to give examples or provide some information without a need for asking question. Statement has area for text and it can contain image, video or audio files. Email address is predefined field that verify if response is valid email format. Numeric is question type to collect numeric type answers. Slider is used to collect numeric answers. Define a range of values you allow as an answer. Use labels as start or end results. For example, you want to grade product on scale 1-10. Add slider and set range from 1 to 10. Than add labels “Poor” and “Excellent”. Rating is the best kind of question when you want to get an opinion from your respondents about your product, service, and the like. Rating greatly affects popularity and traffic. If the ratings are great, the product or service is high, which means you will have more customers. Creating a rating question type is easy, just write a question, choose a scale and symbols like a star, a smile, a heart, or other. Opinion scale measure respondents opinion a gives you better numerical information about how much respondent, for example, like or dislike what you asked. Question group allows you to create matrix type questions, add ‘other’ option or simply ask additional question based on previous answers. For example, you want to know what respondent thinks about your product and you set answers I like your product, I don’t know your product, I don’t like your product. Now you would like to know why user doesn’t like your products. 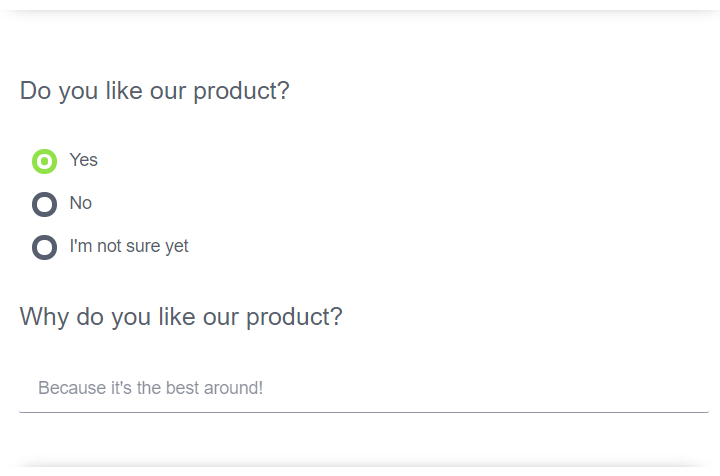 Create a question group, add multi choice question as primary question and then add multiline text question where users that don’t like your product can write a review. Now add Display Rules that will display multiline text question only for users that select ‘I don’t like your product’. Date is commonly used to collect respondents date of birth, seminar dates etc.